Probably every artist in the world wants to display his or her creation on a bigger scale. And seeing something in a much larger scale is by far the most effective way for an artist to show the depth of his idea and to share it with the world in a way that they will understand it and to engage with it. It doesn’t matter what form of art it would be – could be a giant sculpture, some medium sized still or even a tiny diorama, but the size is key element of the emotional and technical aspects of a certain piece of art. Some say with these impressive sizes the artists tend to overwhelm the people who view their pieces or to even make them feel small, but I really think it’s about feeling the depth and the real intention that they wanted to imprint on us as viewers. But what really happens if a certain artist decides to really, really “blow it out of proportions” you ask? Well, like in the case of Stan Herd who spread his work on over 1 acre in order to remake the famous Olive Trees painting masterpiece by the immortal Vincent Van Gogh (1889). Yes, that’s right – a whole acre. 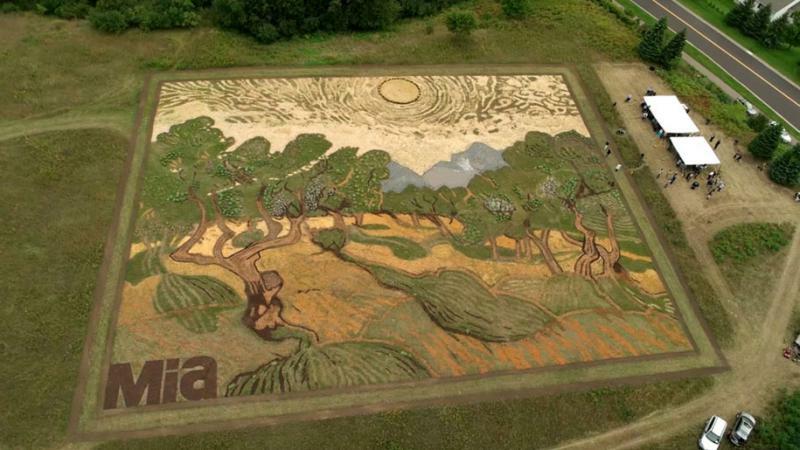 For this gigantic production he used a giant field outside of Minneapolis’ St. Paul airport and with the help of a lawnmower and a bunch of wildflowers Stan Herd managed to recreate this unbelievable Van Gogh technique. What’s even more amazing about this huge project is that it took Herd only about six months to plan and do this whole “earthwork”. He drew his inspiration from Van Gogh for a long, long time and he felt it was an honor to be able to “engage with” his favorite artist. And his devotion can really be seen in the end result, as no matter how giant the project was – it still had a sense of intimacy simplicity to it. 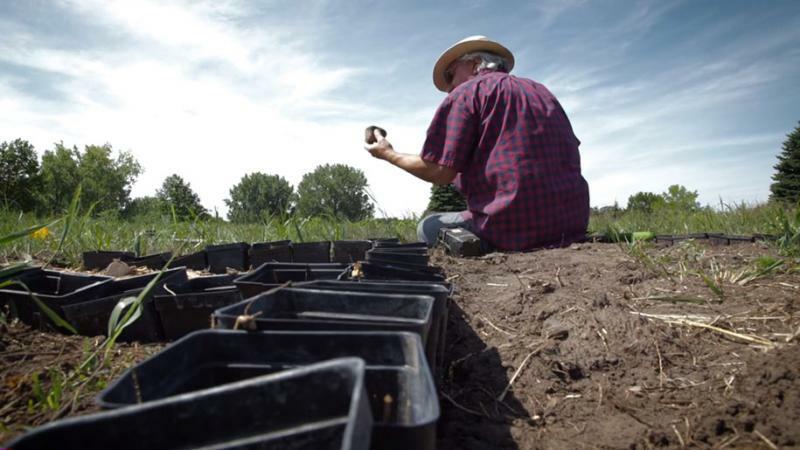 Another prove to that statement is the way he honored the great Van Gogh by going out in the wild, outdoors acknowledging his fascination and respect for nature and farming. It sure is an incredible joy for the passengers that are landing or flying of the Minneapolis’ St. Paul airport. And if you think Herd’s work was huge and awe-inspiring, you should probably sit down for this next one. 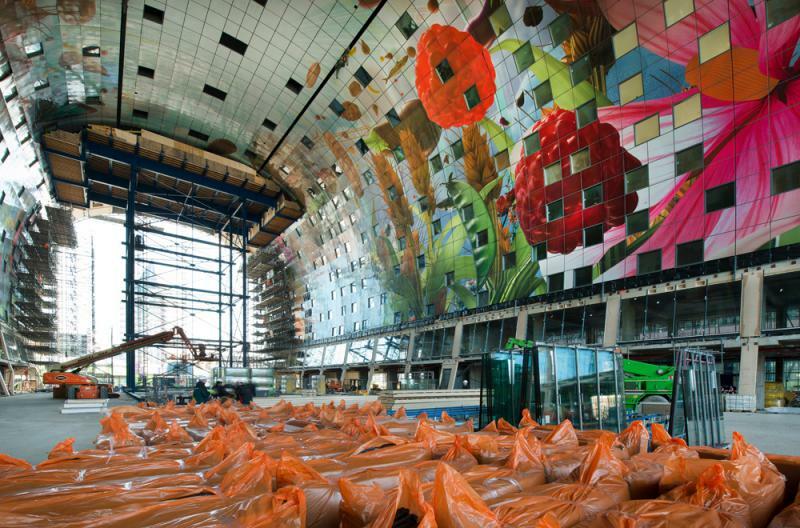 In June 2014 Dutch artist Arno Coenen made what would become “the biggest artwork in the world”. 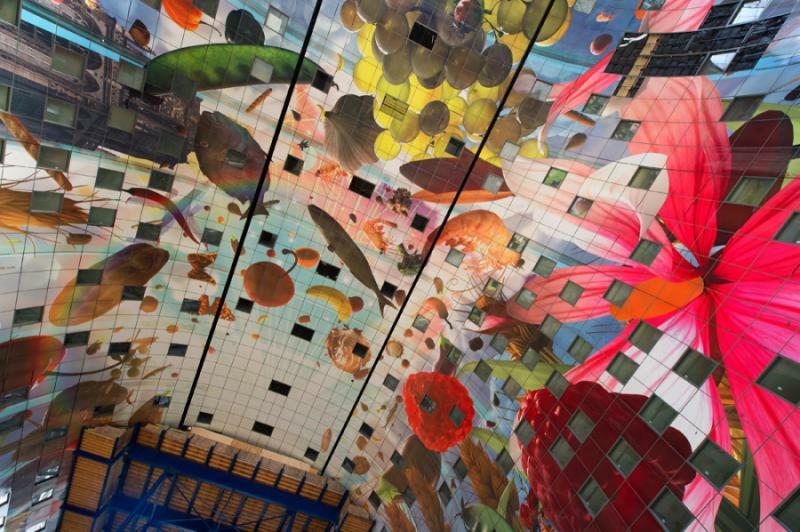 It was created for the indoor market “De Markhtal” in the land of tulips – Netherlands. 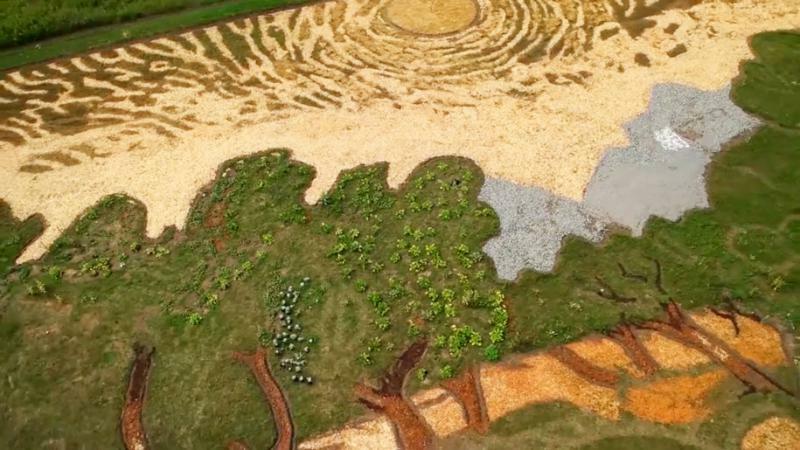 He named it “Horn of Plenty” and it was bigger that two football fields combined, consisting of over 4,000 individual tiles. The Dutchman used the help of some of the creative from the infamous Pixar Studios in order to get the unbelievable high resolution of his flowers, insect, veggies, fruits and sea creatures at the astonishing 1.47 TB. Of course, you can imagine it is full of color and created in a very tasteful and playful manner. There are in fact a lot of similarities with the project of Stan Herd, as it is again dedicated to the beauty of our natural surroundings. And again the enormous size of it manages to escalade those mere images and transform them into something really deep and meaningful. 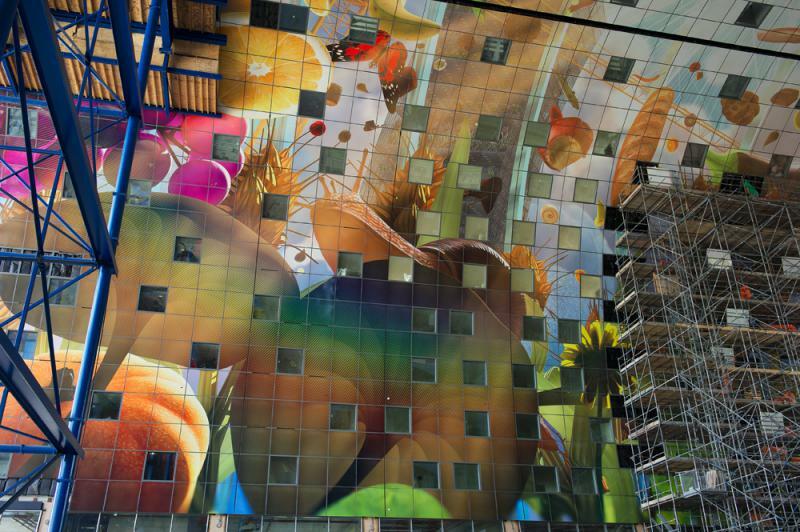 Some even find a great resemblance of these giant projects with the amazing Sistine Chapel, but Coenen claims that his so called “chapel” is more of a tribute to science and the theory of Stephen Hawking for the creation of Earth. Here is one more outstanding gigantic piece of art comprised in the nature. 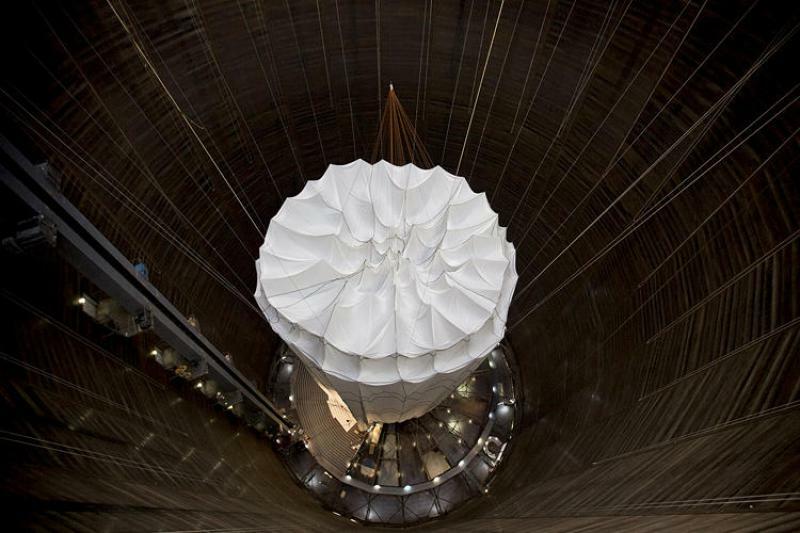 This one is done by Christo. 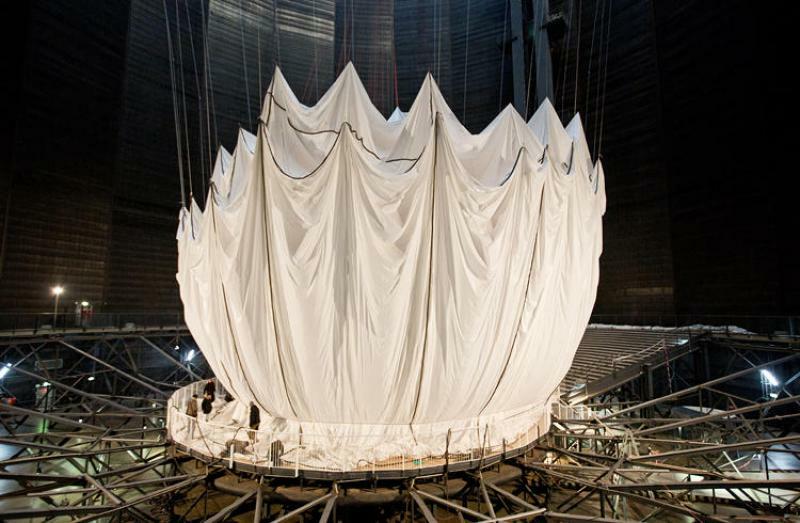 His “Big Air Package” installation was set at the Gasometer Oberhausen in Germany and advertised as the “largest ever inflated envelope without a skeleton”. This haunted looking old building was a former natural gas storage container and is the absolutely perfect example of Christo’s incredible talent of transforming regular everyday objects into something breath-taking and gorgeous. 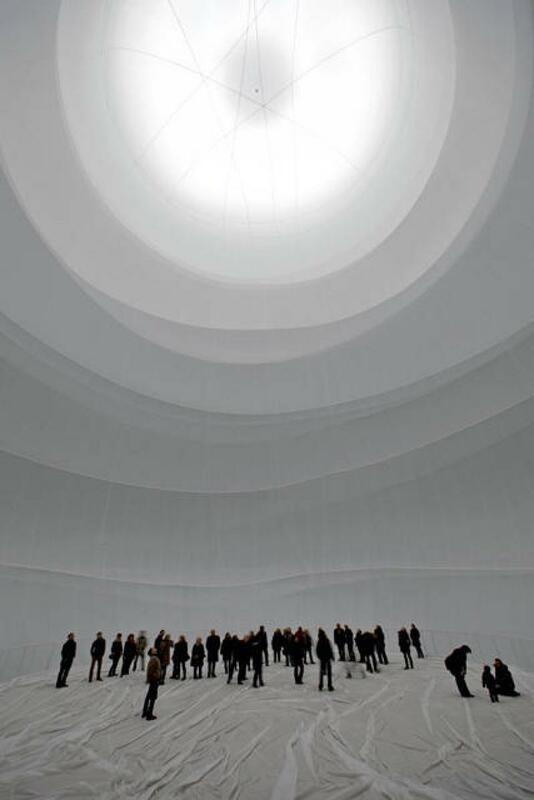 This gas container is the unbelievable 300ft tall and if you stand inside it, you’ll get that exquisite almost celestial feeling with its divine glow and whiteness. But using references like “biggest in the world” is nothing without getting the actual facts straight. So let’s just bring out the Guinness Book of World Records and show you some facts. 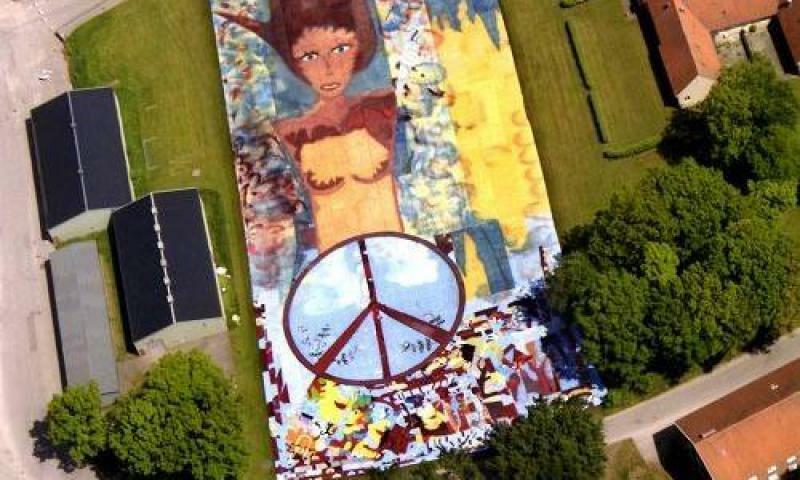 In 2006, an artist named David Aberg created the “Biggest Painting in the World” called “Mother Nature” taking the astonishing 86,000 square feet. In his words Aberg explained that he needed almost a hundred tons of paint and it took him two and a half years to finish this piece inside a giant airplane hangar. The design is a woman who holds a peace sign with the idea being to compel people to live a more peaceful life.